By Leiji Matsumoto. Released in Japan as “Uchuu Senkan Yamato” by Akita Shoten, serialized in the magazine Bouken Ou. Released in North America by Seven Seas. Translated by Zack Davisson. Adapted by J.P. Sullivan. There’s been a wonderful glut lately of both classic 70s manga and also Leiji Matsumoto’s works (frequently those are the same thing). We got Captain Harlock and Queen Emeraldas, and we’re getting the modern rewrite of Harlock. 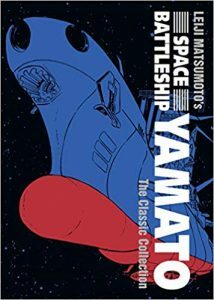 And now we’re getting the original Space Battleship Yamato, with the modern version of that coming out this summer. No sign of a rescue of Galaxy Express 999, but I suspect that’s more complicated. In the meantime, it’s time for more of the best of what Matsumoto has to offer as a manga artist… and also the worst, as Matsumoto is not perfect, nor is this collection. But it does give you exactly what the title promises: Space, and lots of it. Impressive battleships sailing through space. And, wonder of wonders, and ending that, although rushed, actually wraps up the series! Unfortunately, that ending is 1/3 through the book, and the actual ending is the open non-ending we’ve come to expect from Matsumoto. For those who are unaware, Yamato was conceived as an anime, and Matsumoto was brought into it later on in development. He quickly made it his own, though, and the manga began about a month after the anime started. (The anime was also “adapted” into Star Blazers, for those with long memories…) The premise has aliens dropping radioactive bombs on Earth, and the only ones who can stop them is the Earth Fleet… which isn’t doing so hot. Fortunately, they have a secret battleship, Yamato, that can battle the Gamilans, as well as try to seek aid from mysterious blonde-haired, gorgeous, and mostly dead alien babes. (This isn’t Harlock, so the gorgeous aliens aren’t evil here.) Together with trusted old Captain Okita, young and impetuous yet destined for greatness Susumu Kodai, and only woman in the Earth Fleet Yuki Mori, they will defeat the Gamilans… and then have to escape Earth after it grows smug and proud in the aftermath. The main reason to get this manga, in my opinion, are the many pages of the expanses of space. Each chapter features at least 5-6 pages of just space, planets, and stars, and it’s here to show off the wonder of it all. Characterization, on the other hand, fares less well, with everyone pretty much matching to a type. There’s a sense this is trying to adapt an anime rather than be its own thing (which may be true). In addition, I have to say it, I’m not a fan of the way Matsumoto uses humor. His leads tend to be the brooding, serious types, so he balances it out by having the dumbest Milton Berle-style comedy, complete with drunken vets butchering pigs, etc. An exception to this is the robot Analyzer, who would be an R2-D2 ripoff if this weren’t a good three years before Star Wars. His snarky comments did spark amusement from me, especially when they verged on verbal abuse. This doesn’t really hit the heights that Harlock and Emeraldas do; it tries to be majestic, but can’t quite make it. But it’s entertaining as a space opera, and I do love those expanses of darkness with only stars. If you enjoy Matsumoto, give this a try.